Apple Watch hasn't been out a month and it's already receiving its first firmware update with a few minor features and, more significantly, fixes to existing problems. The official release notes indicate that Siri's performance has improved, which means Apple's virtual assistant may answer your questions correctly the first time around. The smartwatch software also tweaks the way it measures activity for standing, indoor cycling and rowing, and outdoor distance and pace during walk and run workouts. Support for accessibility and third-party apps has been enhanced too, and new languages like Brazilian Portuguese, Russian and Turkish have received additional support. Faster third-party apps are important because, outside of the 20 built-in apps from Apple, the smartwatch ecosystem hasn't been as friendly for sluggish developer-made apps. Sadly, rumored features like Find My Watch and Apple TV controls via the "iWatch" aren't a part of this update. Instead, they may launch at Apple's Worldwide Developer Conference. June 8's WWDC 2015 keynote may also give us insight into how to create custom watch faces from scratch, making this gadget a truly personal experience beyond the default 10 faces. Updating Apple Watch requires you to dive into the iPhone app and complete a few more simple steps, according to Apple's directions. 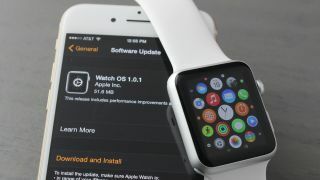 Within the General settings menu is a "Software Update" submenu, which may or may not ask for your Apple Watch passcode, depending on how you set it up. The download requires 51.6MB of free space on your phone and, don't be alarmed, the Apple Watch restarts after the firmware patch has been installed. It's just a bit slow to reboot.